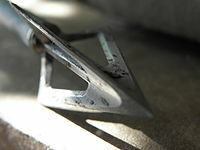 An arrowhead is a tip, usually sharpened, added to an arrow to make it more deadly or to fulfill some special purpose. 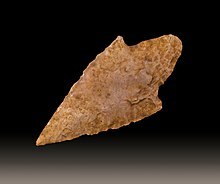 The earliest arrowheads were made of stone and of organic materials; as human civilization progressed other materials were used. Arrowheads are important archaeological artifacts; they are a subclass of projectile points. Modern enthusiasts still "produce over one million brand-new spear and arrow points per year". One who manufactures metal arrowheads is an arrowsmith. 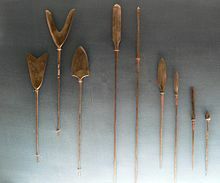 Arrowheads may be attached to the shaft with a cap, a socket tang, or inserted into a split in the shaft and held by a process called hafting. Points attached with caps are simply slid snugly over the end of the shaft, or may be held on with hot glue. 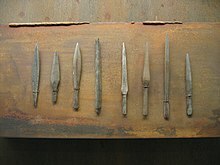 In medieval Europe, arrowheads were adhered with hide glue. Split-shaft construction involves splitting the arrow shaft lengthwise, inserting the arrowhead, and securing it using ferrule, sinew, rope, or wire. Bodkin points are short, rigid points with a small cross-section. They were made of unhardened iron and may have been used for better or longer flight, or for cheaper production. It has been suggested that the bodkin came into its own as a means of penetrating armour, however limited research has so far found no hardened bodkin points, so it appears likely that it was first designed either to extend range or as a cheaper and simpler alternative to the broadhead. In a modern test, a direct hit from a hard steel bodkin point penetrated a set of fifteenth-century chain armour made in Damascus. However, archery was minimally effective against plate armour, which became available to knights of fairly modest means by the late 14th century. Three-bladed, trilobate, or Scythian arrowheads appears in regions under influence of the Scythians and ancient Persians. It was the type normally used by the Achaemenid army. ^ "Mechanical vs. Fixed Broadheads". Huntingblades.com. Archived from the original on 2009-09-25. Retrieved 2010-02-17.